Avalon Waterways is owned by the Lugano, Switzerland-based Globus family of brands, a long-established, family-owned tour operator that serves more than 500,000 passengers each year with escorted tours around the globe. Other companies include Cosmos and Monograms. When Globus decided to enter the growing market for small-ship river travel, it created Avalon, introducing the new river cruise line in 2004. Since then, Avalon, which itself is based in Denver, Colorado, has launched at least one new-build each year. 2014 was a bit more special as the line introduced three newbuilds. In 2015, it introduced its "suite ship" concept to France's Rhone and also to southeast Asia, where it built new vessels for Burma and Mekong Delta itineraries. Expansion continued in 2016 with two suite ships added in Europe. Avalon is primarily aimed at English-speaking markets in North America, Australia and the United Kingdom. Amenities include hotel-style twin beds that can be combined to form queens, nightly turndown service and 24-hour tea and coffee with cake or cookies. Ships have English-speaking crews and continental cuisine that appeals to the North American palate. Breakfast is buffet-style with additional entrees cooked to order. Lunch buffets include two hot dishes, as well as soups, breads, cold cuts, salads and a generous dessert table. Passengers enjoy open seating for four- to six-course dinners, with a choice of entrees (including vegetarian options) as well as a standing menu of fish, chicken and pastas and complimentary red or white wine. Other dining options include light lunch and dinner options and, on nice days on European itineraries, a grilled outdoor lunch on the top deck. Food focuses on regional selections and Western favorites. European and Galapagos sailings provide entirely nonsmoking interiors, and smoking is restricted to specific areas on China sailings. The Avalon fleet doesn't aim for lavish entertainment. The European ships have congenial bars and lounges with piano music after dinner, as well as some local entertainment from musicians. Cruises include a captain's dinner and might offer special features like wine-tastings. Avalon does a standout job with its onboard enrichment, focusing on the region through which each ship travels. Expert tour directors -- for example, a naturalist (on Galapagos departures) -- deliver educational commentary as you pass through interesting landscapes. Local entertainment is also a feature on cruises as part of the cruise line's Local Favorites program. When sailing the Yangtze, for instance, there might be lessons on Tai Chi, painting, calligraphy, mah-jongg or the Mandarin language, as well as the option of Western or Chinese massages. Or, in France, travelers can enjoy on- and off-ship culinary demonstrations. 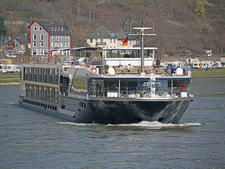 As is generally the case with most river cruise lines, most guided tours are included in fares, though tipping is encouraged. Avalon primarily targets upscale North American, U.K., and Australian passengers in their mid-50s and older. 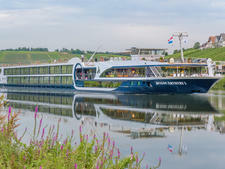 Four- and five-night river cruises are aimed at a younger (40-something) crowd. These shorter-than-average cruises also appeal strongly to first-time river cruise passengers. Avalon operates 16 ships in Europe and offers cruises on seven more vessels in the Galapagos, Amazon, Nile, Mekong Delta, and in Asia on China's Yangtze, Myanmar's Irrawaddy River and also on the Mekong Delta, which features Cambodia and Vietnam. Avalon's original ships -- Artistry, Poetry, Tapestry, Tranquility and Imagery -- have been retired and are no longer in the fleet. Launched in spring 2008, 138-passenger Scenery, the smallest ship in the Avalon fleet, was the first in the line's Scenery class. Four additional ships have since launched, including Affinity, Creativity, Felicity and Luminary. 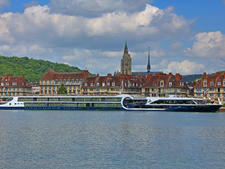 Each of these European river ships offers four decks, including a sky deck for sunning and relaxing. Cabins, all outsides, measure 172 square feet and are among the largest on any of the river ships; junior suites are 258 square feet. Between 70 percent and 90 percent of the cabins have French balconies and sliding-glass doors with protective railings; remaining cabins have picture windows. Cabins come equipped with individual climate controls, flat-screen TV's, radios, telephones, mini-bars, safes and hair dryers. All the ships offer Internet access. Avalon's newest class of ships, its Suite class, was introduced in 2011 with Avalon Panorama, an all-suite vessel. The ship's signature feature is its more-spacious-than-average staterooms, which measure 200 square feet and offer walls of glass that retract almost completely to turn the cabins into what the line calls "open-air" balconies. The addition of slightly curved walls allows for one of the largest bathrooms in standard-class accommodations on any European riverboat. Though these all-suite cabins are spacious, they are not true two-room suites. Public gathering spaces include a sky deck, a large indoor lounge, a smaller indoor club lounge and an outdoor covered-seating area in the front of the ship, perfect for open-air sightseeing on rainy days. Interior design is contemporary chic, with lots of dark espresso woods highlighted with colorful modern art and deep orange rugs and furniture. In 2012, Avalon introduced two more suite ships -- Visionary and Vista -- and in 2013 debuted Artistry II and Expression. In 2014, Avalon launched three more Suite Ships –- Poetry II and Impression in March and Illumination in June. The company added two more Suite Ship newbuilds in 2015 -- Tapestry II and Tranquility II -- and another two in 2016, Passion and Imagery II. 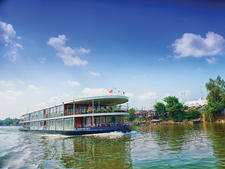 Beyond Europe, Avalon also owns and operates the Avalon Angkor on the Mekong. This 32-passenger ship debuted in 2012. The ship's small size means it can navigate the shallow waterways on itineraries between Vietnam's Ho Chi Minh City and Cambodia's Siem Reap. In 2015, Avalon Waterways introduced two new, 36-guest Suite Ships on the Mekong and the river cruise line's newest destination, the Irrawaddy River. 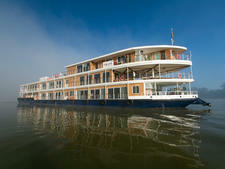 Both new "suite ships" -- the Avalon Siem Reap and Avalon Myanmar -- deliver an intimate experience. Aboard these vessels, travelers are welcomed by 18 well-appointed Avalon Suites with 245-square-feet of living space. And, while other ships may offer guests tiny balconies, these ships introduce travelers in Asia to Avalon's innovative, signature Open-Air Balconies featuring floor-to-ceiling, wall-to-wall panoramic windows measuring 14-feet-wide with retractable screen systems and doors that slide open a full 9-feet, creating the feeling of sitting outside. Avalon also charters spaces on ships in China, South America and the Nile. In China, it offers Yangtze River trips aboard Century Paragon and Century Legend. Each has 156 cabins, 40 suites and seven decks. All cabins have private balconies, and each ship is equipped with a library, pool, gym, cinema and business center that provides Internet access. In the Galapagos Islands near Ecuador, Avalon passengers sail on 40-passenger Isabela II. The current Amazon ship is Amazon Discovery, built in 2015, and for the Nile, it's Sonesta St. George I.